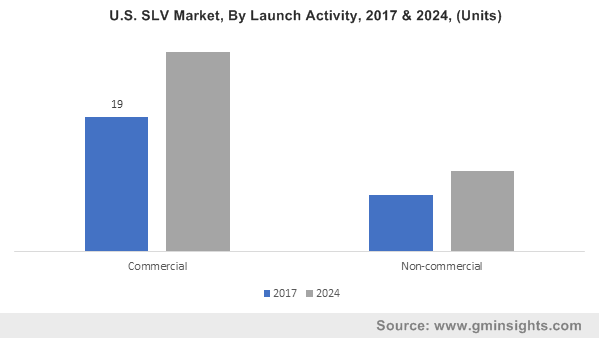 Satellite Launch Vehicle (SLV) Market size was valued at around USD 2.0 billion in 2017 and is estimated to exhibit 2.7% CAGR from 2018 to 2024. Continuous increase in satellite deployment across the globe for navigation, weather monitoring, communication, and remote sensing applications will prominently fuel the satellite launch vehicle market growth during forecast period. According to Satellite Industry Association (SIA), in 2015, overall number of orbital missions grew by around 39% over the past five years. Approximately 3,000 missions are expected to be launched over the 2017 and 2026 timeframe, thereby positively influencing the satellite launch vehicle market size. Rising urbanization and spending capacity have boosted the usage of mobile phones and internet. Growing internet usage, video streaming, online payments and Internet of Things (IOT) are playing an important role in industry growth. As per International Telecommunications Union, in December 2017, the number of internet users crossed 4 billion. Growing connectivity requirement through television, radio and telecommunication mediums across the globe will fuel the deployment of communication satellites over the forecast timeline. Regulatory agencies that include FAA, Office for Commercial Space Transportation (OCST), Department of Transportation, Office for Outer Space Affairs (OOSA), Committee on the peaceful Uses of Outer Space (COPUOS), International Telecommunication Union (ITU) and International Amateur Radio Union (IARU) provide norms for use of launch vehicles. For instance, OCST has laid international law to allocate responsibility of damage that occurs during launching. These regulations are expected to present considerable challenge to the commercial applications and inhibit the satellite launch vehicle market size. GEO orbit accounted for over 65% of satellite launch vehicle market revenue with around 34 launch of orbital missions in geosynchronous orbits in 2017 owing to their major application in intensive observation data analysis, environmental and homeland security monitoring. These remain at same distance with respect to earth and do not need reorientation. The GEO orbit enables low cost communication, less maintenance, ideal for observing remote locations, provide reliable transmission and can easily share data among government users. LEO satellite launch vehicle market will witness steady growth owing to growing requirement of efficient communication to serve the consumers. Rising penetration of smart phones, smart devices and services will propel industry growth during forecast period. Moreover, development in communication network to provide better internet speed and provide connectivity in vehicles, infrastructure and homes will provide positive outlook for satellite launch vehicle market share. Primary payload dominated the industry share in 2017, owing to significant number of missions developed for specific operations. In 2017, the segment was pegged at over USD 5 billion with around 50 launch of orbital missions with single payload. Increasing number of launches every year, in conjunction with the development of new launch sites to cater the growing application requirements will drive the overall industry growth. For instance, in December 2017, Indian Space Research Organization (ISRO) planned to launch a combination of 28 nano-satellites from countries including the U.S. and Finland. Commercial satellite launch vehicle market will witness over 3% CAGR during forecast period owing to its increasing requirements in end use industries that prominently includes mineral & energy exploration, earth observation, electronics, military and information & telecommunication. Increasing number of launchers integrated with built in navigation units that support automated operation in the event of loss of communication will positively influence the SLV industry growth. Rise in test flights by commercial service providers such as the International Launch Services (ILS), Russia will provide stable growth platform for commercial satellite launch vehicle demand. Non-commercial satellite launch vehicle market will witness steady growth with substantial requirement for government, military, civil, research and other such non-profit operations. Military agencies across several economies such as the U.S., India, China, and Russia have increased the number of space missions for conventional applications such as intelligence gathering, navigations and communications. In March 2017, the U.S. Department of Defense launched ninth Wideband Global SATCOM system to support US military forces. Further, the department planned to launch tenth and final spacecraft in 2019. Communication application segment accounted for over 45% revenue share in satellite launch vehicle market owing to growing deployment of small size communication satellites. As per SIA, communication comprised of over 50% of total space deployments till December 2016. Automobile, aviation, maritime and defence industries have witnessed an increase in the number of connected devices with growth in applications such as Internet of Things (IoT). Paradigm shift of physical devices towards smart devices to improve consumer experience is among the major trends gaining traction. Increasing demand for commercial SATs to support infrastructure will boost the communication application growth prospects. Scientific satellite launch vehicle market will witness sturdy growth with their application to obtain data on space radiations, magnetic fields, atmosphere, the sun, stars, planets and other astronomical objects. Increasing number of space programs from international space agencies including the National Aeronautics and Space Administration (NASA) to study outer space will further enhance industry growth. Europe dominated the satellite launch vehicle market size in terms of revenue owing to significant number of launches in France and Russia. In 2017, the region accounted for over 35% of industry revenue owing to presence of reliable facility providers for worldwide commercial market. Some of the advanced launchers such as Ariane 5, Soyuz and Vega that provide facility for product service are among their major developments. By April 2018, Ariane 5 had launched over 200 satellites during its operational career. European Space Agency is developing innovative vehicles in response to fast changing commercial launching services. EIA is planning to introduce Ariane 6 that will succeed Ariane 5 in 2020. 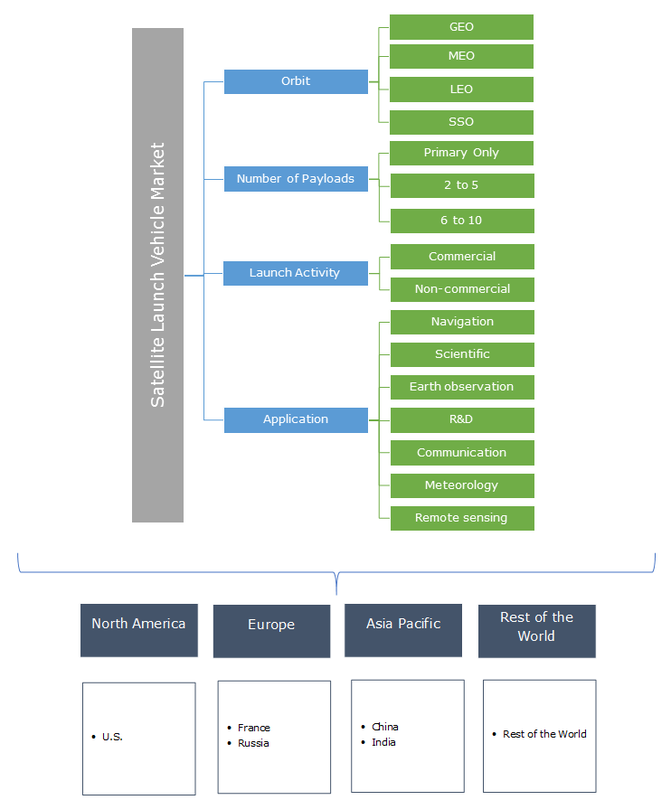 Asia Pacific satellite launch vehicle market share will witness substantial growth over the forecast period. Existing geopolitical differences between China & India in conjunction with the increasing focus on interplanetary missions are expected to be among the prominent factors driving the regional space missions demand. Major players of SLV market include ARCA Space, Blue Origin, Boeing Space and Communications, Bristol Spaceplanes, E Prime Aerospace, Eurockot, Indian Space Research Organisation (ISRO), Kelly Space & Technology, Lockheed Martin, Mitsubishi Heavy Industries, Northrop Grumman Corporation, Scaled Composites LLC, SpaceX, and Virgin Galactic. Industry participants are undergoing long term agreements with FAA (Federal Aviation Administration) approved complexes to launch and testing to improve their global positioning. For instance, in September 2015, ARCA Space Corporation and Spaceport America, a commercial spaceport, declared partnership for space launch vehicle and high-altitude aerospace testing. These space missions carry spacecraft from earth’s surface into outer space. The complete system comprises of vehicle, launching pad, fuelling system and other infrastructures. The satellites are packed carefully onto the SLVs before blast-off and powered by rocket engine. In carrier rocket, only payload is carried to the orbit and other systems help in escaping the earth’s orbit. The system requires combination of accuracy, efficiency, power, and immaculate planning to place the spacecrafts into their orbits. Most of the vehicles are designed for one-time usage.